For more years than I like to admit I have admired the work and enthusiasm of Clive Cussler I am a typical fan who has all his books. My own diving career has seen its own highs and lows, in 1999 when ill health forced the retirement of my scuba diving exploits I could not have envisaged then how much I would have missed it. 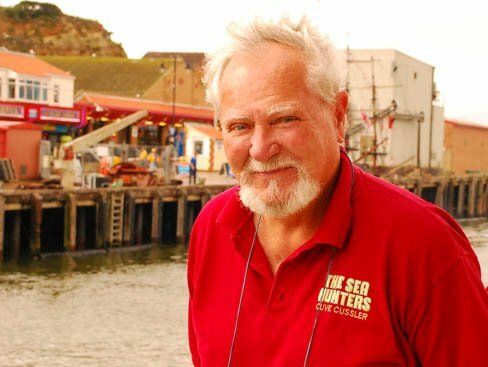 A couple of weeks into the dive season an article appeared in my local newspaper that contained news of Clive Cussler as being a aboard vessel searching for the location of the Bonhomme Richard, lost down the coast off Flamborough. Clive even agreed to a photograph outside the newspaper offices. Clive's inspiration for mounting an expedition to find the Bonhomme Richard derived from reading a book on an infamous battle of Flamborough Head written by Peter Throckmorton. I was amazed to read that someone I had admired for many years had been just across the river onboard a green ex- trawler I had seen coming and going from the port. 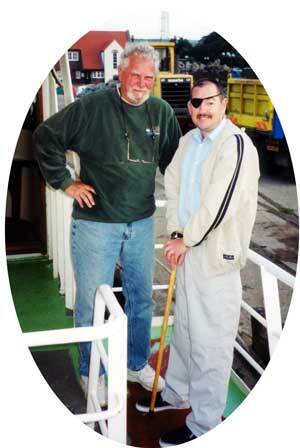 I was still recovering from my second bout of neurosurgery and getting over to the boat was not possible. 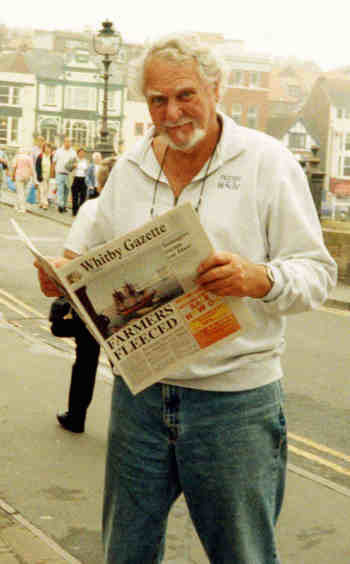 When the expedition was finished and the boat left Whitby I felt disappointed that I was not able to have had the opportunity of meeting Clive in person. I was able to obtain a copy of the newspaper photograph, which I sent to Clive with a letter on my background. A number of weeks passed before my stamped addressed envelope returned, inside was the photograph duly signed along with a small letter indicating that he was planning to return in July 2004. Clive made his first attempt at finding the the wreck location in 1978, an expedition that was beset with problems. In 1978 there was very little accurate wreck positioning equipment available certainly nothing similar to what is available today. The expedition, members included with Bob and Teri Toft (nee Cussler), Sidney Wignall (underwater explorer), Gary Kozak (side scan sonar operator), Marty Klein (CEO of Klein Industries, builders of the sonar equipment), Walter Schob (diver), he also had the support of other family members with his other daughter Dana, his son Dirk and his wife Barbara present. The charter vessel itself was by all accounts nothing spectacular. Clive once described it as A decrepit old minesweeper that went down with all hands in the North Sea a few months after we chartered her. She was called the Keltic Lord, but certainly didn't look like one. The expedition raised more question's than were answered, costing around $80.000 in the process. A second attempt was made the following year headed by Naval Commander Eric Berryman, it was more successful with a number of wrecks located and identified although the Bonhomme Richard was not amongst them. Expedition members included Peter Throckmorton himself and Bill Shea (Brandies University) who went on to become NUMA trustees. The vessel used this time round was the better equipped Arvor III, skippered by Jimmy Flett. A short third was attempted during another North Sea expedition in 1984 using more sophisticated equipment but the location of the ill fated vessel remained elusive. I had another bout of complex neurosurgery in January but I was hoping that by July I would be well enough to meet Clive should the opportunity arise? 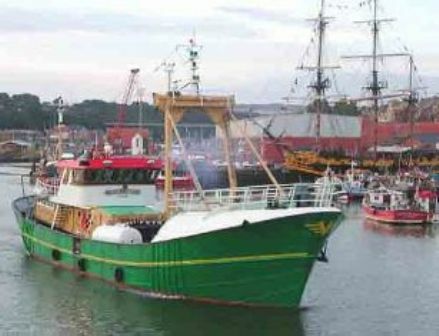 In July I kept vigil looking for the green shape of the charter vessel "Ocean Dancer", when it approached the wharf I looked on hoping to see him on deck. Some days later I sighted Clive on the boat overlooking the decompression chamber that was on the deck. Although not 100% fit I was determined not too miss another opportunity of personally meeting him and took a taxi to the dockside, hoping that he would be willing to see me? I introduced myself and my fears were soon resolved as I was welcomed aboard by Clive. With me I had a copy of a chart made up by a Carl Racey and Andrew Jackson, a dedicated team of deep divers who have experience in the area I knew Clive to be working, Carl and Andrew had gracefully allowed me to permission to share the chart with Clive. In the forty minutes I was onboard we discussed many things including his current expedition and the novel he was currently working on at that time. He gave me an indication that his next novel may perhaps be the last (although it turned out to be just one of those moments)? I found Clive to be an extremely pleasant man and it seemed we had quite a bit in common, although he is a great deal further up the ladder than I can hope to achieve in this lifetime! Although no longer actively diving I retain a large number of diving colleagues, the team I spoke of earlier might even have information or hold positions that might be of interest to his current search and it was agreed that I would act as the middle man in getting everyone together, a prospect that had me enthusiastically fired up on its own. The ship left the port a few days later which gave me time to arrange a convenient time and day for Carl and Andrew to be available when the ship returned. Four days later the ship was making its way towards the entrance to the port and having called for the swing bridge (essential to get into the upper harbour) I was alerted to the vessels return by friends in the harbour office. When Carl and Andrew made it through to Whitby we made our way over to the boat where we were greeted by Clive and his son. I was introduced to Dirk Cussler and we listened intently as Carl and Andrew explained their background to Clive before they got to the topic of the search areas and what input they might have to offer. The experience brought back memories of how things used to be, it seemed quite surreal to be sat on the bridge of a ship with Clive and Dirk Cussler as we discussed a major expedition. Since my first craniotomy in 1999 I retain a close interest in the diving scene although at times detached from the daily going on's, yet here it felt remotely like it had been part of a dream (or nightmare). It felt like I was back amongst a part of my life that I never knew I missed so much, it felt like I was part of the team giving me such a buzz. Carl and Andrew left the ship and I stayed with Clive and Dirk talking for sometime on a more personal level. I knew Clive's wife Barbara had passed away in 2003 and was surprised to learn it was as a result of cancerous brain tumour's. Thankfully my tumour's are benign, although I can understand some of the pain and trauma Clive and his family had experienced. Clive was due to return to America the following morning leaving Dirk to run the expedition. Clive told me that if the current searches did not bear fruit he is not sure if he will be back, although he did acknowledge finding the location of the Bonhomme Richard would fulfil a huge goal for him! I swapped signed copies of my latest book with Clive and in parting I commented that it was a privilege to have shared some time with him and Dirk, to which he replied that it was an honour to meet me, (I didn't know what to say)? Clive told me that at the end of this latest attempt the team will have covered a vast search area with the possibility that the wreck site might never be found? If it is successful then I will feel quite proud that I have had my own small part to play? I was so chuffed to have met Clive and Dirk. I was reluctant to do the tourist bit of asking for a photograph, but the camera was burning a hole in my pocket and I was eager not to let the opportunity pass me by. Thankfully Clive did not mind and even asked me to send him a couple of copies, two hours later I left the ship on such a high. When I was able I went out to photograph the vessel as it made its way in and out of Whitby on the next leg of the searches. I was welcomed aboard for updates although I restricted my visits and did not go aboard each time for fear of wearing out my welcome. Before the team left Whitby for the last time I presented the skipper with a CD-ROM I had put together which contained all the photographs of 'the dancer' I had taken. The disc was really appreciated and I was told that I was welcome aboard anytime! I was sad to see the end of the expedition as it stirred emotions of my time as a diver! The expedition ended with not having firmly located the expedition target, although it did reveal some interesting seabed anomalies. When Dirk confirmed high possibility that they would be returning the following year, I made my farewells and looked forward to getting reacquainted in 2005! The searches continue with far more ground being searched during successive attempts, follow the link to the next installment of the exciting Bonhomme Richard Expeditions.